When browsed in IE6, the left part of each question is wrongly aligned. Don't tell me to abandon IE6, seriously. Upgrading to IE8 will fix IE6 issues. Just kidding (not really). I think Jeff Atwood has said that they will only support IE6 so far as guaranteeing that the content (text) will be displayed on the page, but they won't make any special IE6 formatting fixes, so you're stuck with bad formatting. Making the conscious decision not to bend over backwards to support a broken browser is a technical decision. It's all about pros and cons - bearing in mind that SO is a site for developers, I'd expect the browser distribution to be skewed towards modern browsers - whether that's newer versions of IE or other browsers such as Chrome and Firefox. Jeff and the team have a limited amount of time on their hands: do you really think they should spend significant amounts of time trying to get a broken browser which isn't used by that many SO users to display SO decently - while trying to keep it working on working browsers of course - rather than spending time on features which benefit everyone? Admittedly StackExchange probably changes this a little - I wouldn't be surprised to learn that Fog Creek could be spending more time on this, for example - but accusing people of not being "technical" just because they have made a decision you don't like isn't really going to help. Rendering problems specific to Internet Explorer 6 are not going to be fixed. Don't tell me to abandon IE6,seriously. IE6 needs to be put down, there's really no avoiding it. Developers need to stop supporting it, not as far as actively blocking it, but they need to communicate more clearly to users that "If you're still using IE6, any problems you have are your problems, not ours." 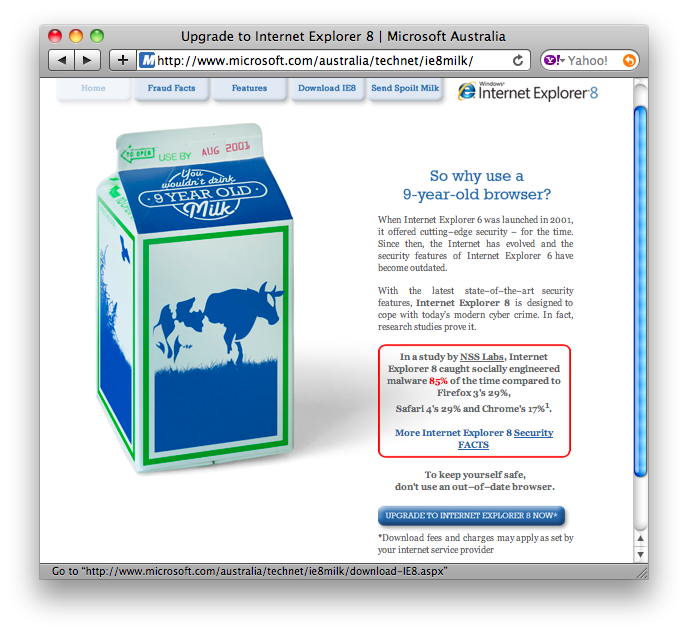 If you seriously want to avoid being told that you need to upgrade, then you seriously need to stop asking about IE6. The only correct answer to your question is that you need to upgrade. People still on IE6 need to upgrade, the rest of the world should not suffer because of this. If you think "it isn't much that needs to be done" then consider how many websites that probably have IE6-related layout problems, and how many man-hours that needs to be put into fixing things like this. Personally, I would rather have the SO-team spend their time on far more important things (like fixing the minor problems left with markdown in some corner cases) than spending even 1 minute on trying to fix an IE6 problem. If the only problem you have is a minor alignment problem, then I'd say that this IE6-problem shouldn't even be considered. In fact, the time people here, me included, spend on giving you "answers", is probably more time than the issue deserve. I understand that you're serious, and you probably cannot upgrade, for whatever reason (you don't say), but in reality you're just one guy, and even if we count all of the users still left on IE6, they will be a minority, and many of them could upgrade, so if we limit the discussion to all those that cannot upgrade, and want to use SO on IE6, having a minor alignment problem is a price you'll have to pay. So yes, you really should abandon IE6. And don't forget about Opera. Anyway, the site doesn't look that bad in IE6 anyway. I also have to use IE6 from work machines. We are not allowed to upgrade and we are not allowed to use other browsers. Why have the designers chosen to discontinue IE6 support? How do you prevent “Here code. You fix.” questions?